Fresh off my trip to BlogHer, I am home and in processing mode. My weekend held a few letdowns and a lot of happy surprises. I had some amazing conversations with friends new and old. I had a chance to enjoy the city and see a fantastic movie. It was not the BlogHer I expected, but it was a great experience. While I consider it all and how I can apply what I learned from my experiences to my real life, I want to share a really special moment. My friend Robin is a fantastic and hilarious artist who loves to inspire people through humor. She creates art and greeting cards that are side-splittingly funny. But beyond that, she is the real deal. Her heart is full of love for others and it shows in everything she does. During one of the conference parties, she was writing messages on people’s arms. Some were funny, some were sweet. Some had people in tears. When I realized she was doing this I ran in to find her. The party had ended and she was exhausted. But in true Robin fashion she agreed to write my message. She looked at me and asked me to tell her what I would say to myself when I am feeling down. What would I need to hear to be encouraged on those really hard days? I described how I needed to get out of my own head in those times and look out to others. 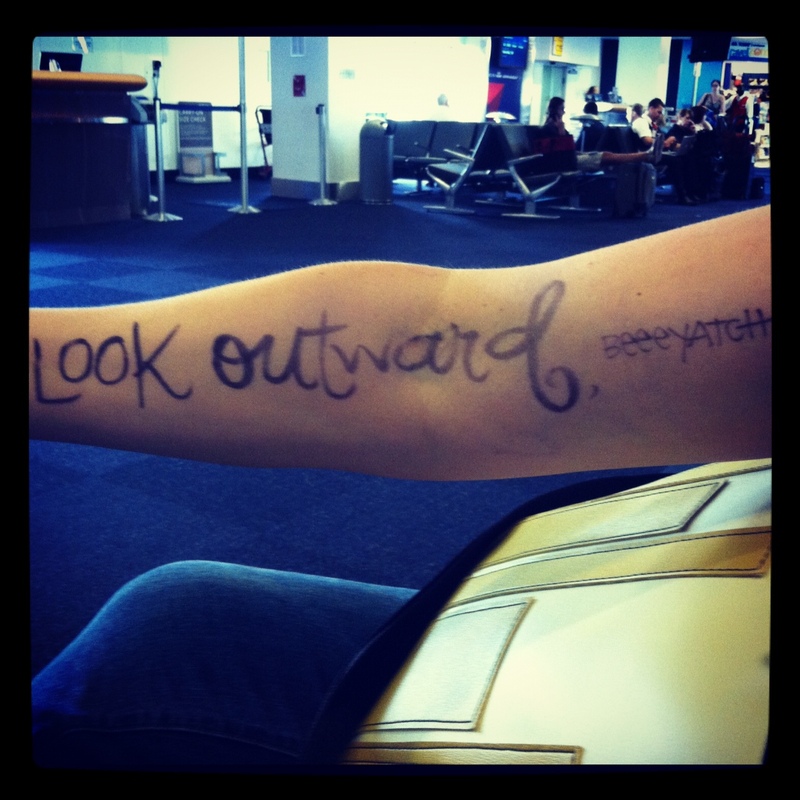 She smiled and started writing “Look Outward” and then with a grin, asked if she could swear on my arm. And this is why I love Robin. Even though it wasn’t exactly the weekend I was expecting, I was reminded that I am in a community. I had some amazing times with some brilliant women who are from all over the country (and a few from Canada!). And they weren’t just surface conversations. I spent time with friends from Raleigh that I don’t see nearly enough and from other states that I love to chat with online. I am so thankful that I can share my passion with people who get it. And I am inspired by their friendship and honesty. Thank you Robin, for giving of yourself so freely! Yes, this. Love you friend. Loved seeing you. Now how the heck did I not see Robin :(. Tonya it was great to see you too! I wish we could have chatted longer. I’d love to hear how the stumble walk went! Well your best is pretty dang awesome lady. Run and tell THAT. I’ve heard so many contradictory reports from BlogHer – but I think this sums it up nicely. Thanks for sharing! That is awesome! I wish I would have seen you both at BlogHer. I love the message she wrote for you. Great advise for so many of us. BlogHer is such an emotional time, must be all of our hormones racing! You looked great and I am glad I got to say hi to you. That woman, how she makes ANY PLACE so special.